State Minister for Foreign Affairs M Shahriar Alam on Saturday said Bangladesh will engage with the world in a bigger way doing everything on diplomatic fronts to take the country to the next stage of development with more trade and cutting dependency on aid. “Bangladesh is ready for business. Bangladesh is attracting investment,” he said mentioning the country’s engagement with the Kingdom of Saudi Arabia, Japan, China, India and other countries on trade and investment fronts with much focus on economic diplomacy. Shahriar said Bangladesh, over the last few years, witnessed visits of trade delegations tagged with each high-level bilateral visit to Bangladesh that shows the country is ready for expanding business. 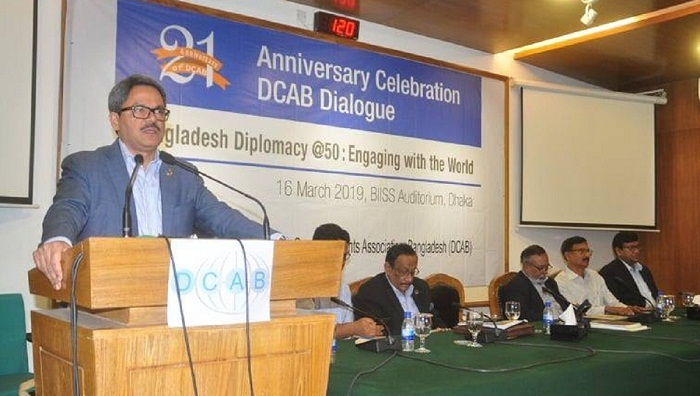 Diplomatic Correspondents Association, Bangladesh (DCAB) arranged the dialogue titled “Bangladesh Diplomacy @50: Engaging the World” at the auditorium of Bangladesh Institute of International and Strategic Studies (BIISS), marking its 21st anniversary. BIISS Chairman Munshi Faiz Ahmad and former Foreign Secretary Md Touhid Hossain spoke at the dialogue attended also by Foreign Secretary M Shahidul Haque with DCAB President Raheed Ejaz in the chair. Centre for Policy Dialogue (CPD) Senior Research Fellow Towfiqul Islam Khan presented a paper on ‘Bangladesh’s Priorities in Economic Diplomacy’ at the dialogue conducted by DCAB General Secretary Narul Islam Hasib. The state minister said every country needs to find its own equilibrium and mentioned that Bangladesh is a significant player in the region. He laid emphasis on capacity-building, saying Bangladesh will focus on all fronts of diplomatic engagements and every aspect of global affairs as it is moving towards becoming a developed country by 2041. “The Foreign Ministry will further expedite its efforts,” Shahriar said, adding that challenges will be there but those can be overcome if the intention remains good with much focus on people’s wellbeing. He said Bangladesh opened around 17 missions abroad over the last 10 years while it has a plan to open 10 more in the next five years. About the Rohingya issue, the state minister said Bangladesh needs to move on without confining it to one single issue as it has many more to deal with. Highlighting Bangladesh’s meaningful engagement with Myanmar and the world, he said Bangladesh is on the right track and no country will get any chance to criticise it over the issue as they did not get in the past. “We’ve not failed,” he said, adding that the entire world is with Bangladesh. Towfiqul Islam focused on investment issues and laid emphasis on engaging the private sector and promoting joint venture. He also talked about comprehensive economic partnership agreement and having bilateral Free Trade Agreement (FTA). Earlier, the state minister along with founding members of DCAB cut a cake marking the 21st anniversary of the association, and launched its official website. The DCAB honoured its five founding members - Barta24.com Editor-in-Chief Alamgir Hossain, Kaler Kantho Executive Editor Mostofa Kamal, Bhorer Kagoj Editor Shyamal Dutta, senior journalists - Anis Alamgir and Aman Ud Dowla -- at the function where they shared their memories with DCAB since its inception.